ROAD. NAMED BY PIONEERS FOR THEIR CHIEF OCCUPATION. BAPTIST CHURCH WAS ORGANIZED ON MAY 14, 1865. MURCHISON, TOM TATUM, JOHN P. UTT. MARSHALL: JEFF HINES. FARMERSVILLE “TIMES” AND THE FIRST NATIONAL BANK. CATTLE, COTTON, AND MAIZE CROPS REMAIN IMPORTANT. BEFORE HE ENTERED THE UNITED STATES ARMY. My father, Walter Yeary, native of Tenn. and who had served as a Capt. in the Army of the United States, settled near the present site of Honey Grove in Fannin Co. in 1839, two years before John Neely Bryan, raised his Ebinezer in the shape of a Log Cabin, at the forks of the Trinity, so said W. B. Yeary, 3113 Live Oak St. There were seven families in the Party with which father came. The Settlement which they established was one of those extreme outposts of civilization, which seemed to have such siren charms for the hardy pioneers. It would take too long to detail what befell the Settlement, therefore, let a single incident be a sample of the whole lot. One morning nine Indians, catching my grandfather at work with a hoe in the garden, cut him off, all unarmed as he was, from the cabin, but rising equal to the occasion, he reversed the idea of converting the sword into a plow share, and turning his hoe into a weapon of War, put up such a bristling front that the Indians retired before him. All the time my grandmother was trying to slip his gun to him. In the fight both of my grandparents were wounded with Arrows. In 1845, father and my grandfather, Moses Jones, and some other members of the Settlement moved to Collin County. Father set up as a merchant. The Frontier merchant in those days, carried nothing but powder and lead, sugar, coffee and whiskey. Father ordered his goods from Jefferson, and it seemed that a hogshead of sugar was delivered several days before the wagons carrying the rest of his stock arrived, in the meantime he had nothing to sell but sugar, from that circumstance, the store took on the name of Sugar Hill. 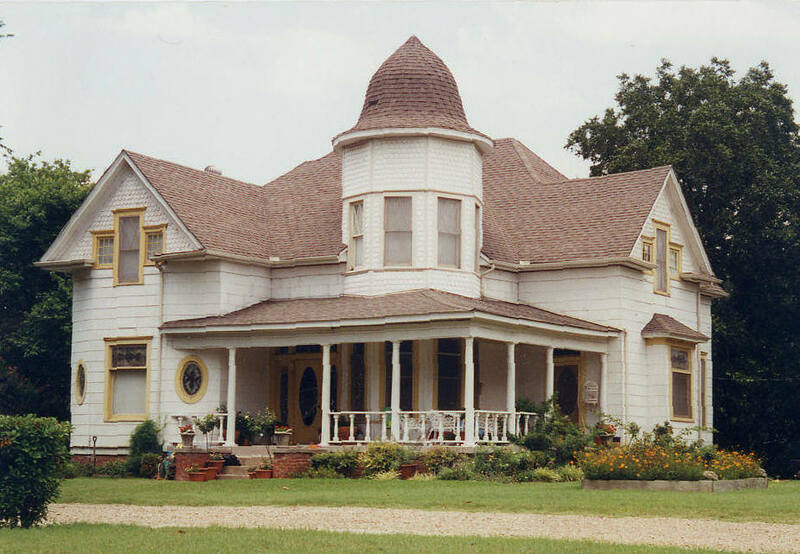 Sugar Hill continued as a trading point of the Community until the town of Farmersville, two and a half miles away was established some years later. The Settlements in North Texas were few and far between, and next to no land at all was in cultivation, because there was no market for farm products, and it was easy fro the pioneer to make a living with out much labor. The country was open in every direction and the traveler could for days and days pursue a straight course toward any point of the Compass without having to detour on account of a fence. My grandfather, Moses Jones, was the Doctor and the Baptist minister of the Sugar Hill Settlement. I am sure that he did not take any regular course in a Medical College in this country nor in Europe, as a preparation for the practice of his Profession. His guides were his natural sagacity and the Book of Old Dr. Gunn. This Book which I still have in my possession, in my library, describes the medicinal plants and herbs and tells how to use them and make them grow, and how to extract the active principles from them, then it lays out a map of the ordinary diseases and tells in each case which of the medicines to give, in fact the Book is bequeathed to the World as an exhaustive treatise on Medicine. Grandfather cultivated in his garden, all of the plants he needed in his practice. He had to buy nothing but calomel and blue mass, quinine had not yet come into general use, at least, it had not found its way out to the Frontier. The death rate from natural causes was extremely low among us, and Dr. Jones has gone down in History as a successful physician. Preaching and practicing Medicine did not afford sufficient scope for the prodigious energies of my grandfather, Moses Jones. He busied himself about many other things. He built, owned and operated the first Mill erected in the community. It was a treadmill worked by oxen. It ground both corn and wheat, and grandfather took his pay in toll, that is, he reserved from himself a certain part of all grist brought to the mill. The mill separated the worked up wheat into four classes, 1st grade flour, 2nd grade flour, shorts and bran, those who came to mill took home with them flour of both grades, and enough of the shorts to furnish the women material for making starch, and left the bran as worthless at the mill for grandfather to dispose of at his own expense. The shorts left behind by his patrons was more than sufficient to feed the sluggish steers which grandfather employed to make the mill go. The flour and meal into which he had converted the grain he had taken as toll, he sold at the mill or sent it to Jefferson or Shreveport, where he exchanged these products for sugar, coffee, and whiskey. I was eight years old when I pulled on my first shoes. They were made by John Frank, hunter, farmer, saddlemaker and shoemaker. He had no shoe leather in stock when he took my measure, but he did not let that hinder him, he used harness leather. I tied the shoes on my feet with strips of buckskin for strings, up to that time I had gone barefooted. My favorite sport when a small boy was to trap quails and prairie chicken, when the snow was on the ground. I kept a piece of board heating before the fire to stand on while I was taking the birds from the trap, and setting and re-baiting it for the next comers. Every night we children would grease our feet with mutton suet and bake them before the fire, but in spite of this precaution, my feet often would crack open and bleed. We had a lot in which we penned the cows at night and the calves in day time. It was my business to drive up the cows in the evening and the calves in the morning. The tall grass was often wet and drenched with dew in the morning, and I got wringing wet and chilled to the marrow, but my lot was not harder than that of the rest of the children in the Settlement. It seems that something of the old idea of exposing children still lingered on in my generation. The first money that I ever had I made it raising peanuts, father got the seed from a neighbor who had come from Georgia, father put the peanuts that I had raised on sale in his store, and they brought three dollars. After long pondering I decided to buy me a trunk with my money, accordingly, I gave the money to my brother who was starting on a wagon trip to Jefferson, on the way his wagon broke down and he had to use my three dollars to get it repaired as he had no money of his own. People had no money in those days they did not need it. Not to let my story tail off. I never got my money back, and I do not know but it was a good thing for I was going to invest it foolishly, for I had nothing in the world to put in the trunk. The first horse wagon that rolled into our community was a sensation. The owner of it had brought a load of apples all the way from Springfield, Missouri. The wagon was loudly painted all over with garlands of flowers on the sides and end of the bed. Father bought the wagon and the harness, people came from far and near to marvel at the wonder. We cut quite a swell when the family went to church in the new turnout, when everybody else was walking, riding horseback or in Ox wagons. About 1870, I cannot be quite sure of the year, Father, on a visit to New Orleans, came across a sewing machine, the first he had ever seen or heard of. He brought it home, men and women all over the country laid down their work to come and look at it, when the novelty had a little worn off, the women began to bring their sewing and the machine was kept busy going night and day. Our house was the scene of a continuous sewing bee. Howard Crawford was the first man to plant cotton in our section of Collin Co. He brought the seed with him when he moved from Alabama to Texas. As an experiment, he planted nine acres in 1870, it turned out 10 bales at a Gin which John Haven made by overhauling an old tread grist mill run by oxen. He hauled the cotton to Jefferson. Crawford distributed the seed of the crop among the neighbors, several of whom tried cotton planting the following year, with the most encouraging results, after that the acreage of cotton was increased annually. In the early seventies Cotton was sold at an average of twenty cents, but it was not until after 1880 that any considerable part of the land in this part of the country was put under cultivation. In 1880, B. R. and E. Houghton of Farmersville, bought 200 bales of cotton on account and hauled it to Terrell. I drove one of the wagons, at that time there were only eight houses on the road from Farmersville to Terrell, a distance of thirty five miles. Wild cattle still ranged over the open country, and a fierce bull who had set himself up as a monarch of the plains, bellowed, pawed up the earth and disputed the way with the forward wagon in our train. The men got down and flayed him wit their long ox whips, and he retired in confusion. Down to 1880, such a procedure as giving a Mortgage on a growing crop was unheard of among the Settlers, and the first Mortgage of the kind was signed by candle light in the back room of a store at Farmersville, as with disagreeable things generally, it was considered appropriate to go through the formalities in the dark. RECOLLECTIONS OF AN OLD TIMER. The first election that was ever held in east Collin, was held on the old Patton Honaker place and the name of the place was Sugar Hill. A man by the name of Bailey ran a sort of a store there. He married Miss Cassie Year, a relative of the Yeary's whose offsprings are living at Farmersville today. The voting precinct included the entire territory from Millwood to the Fannin county line and from pilot creek to the east. The line between Collin and Hunt counties had not been established and the law as to where a citizen should vote was not as painfully strictly enforced as it is today. At that election just 17 votes were cast, and the 17 tickets were all alike that is every man voted just as the balance did. Jim Throckmorton, who became later governor, run that time for the legislature and was elected. He got 17 votes at Sugar Hill. Those days Throckmorton was not dreaming of governorship but he was practicing medicine about three miles from McKinney. There were then two stores at McKinney one of them run by Newsome. There was two stores at Greenville and none at Farmersville. Of of 17 men who voted at the first election on Sugar Hill, two are alive yet. One of them is Josh Gotcher, living about three miles west of Farmersville now, and the other is Hugh Woody living about four miles north from Farmersville, close to the old Franklin place. All others have passed over the great divide. Old man Woody lived then in a cabin of Henry Rollin's on Cedar. His nearest neighbor to the north was Bill Boren who lived close to the Manning prairie near Pike. To the south a man had settled on Cedar, the old Coffey trail ran by his cabin and there was not another cabin between his own and the Boyart place north of McKinney. He dragged the high grass down between Cedar and Sugar Hill and established a route. Old man Woody is hale and hearty: only yesterday he was hard at work fixing his fence. He has in his possession yet a pair of scissors, that were bought from Bailey on Sugar Hill. We tried to get some big Indian stories out of him, but he wont yarn. No Indian, he said, but plenty grass, lots of game, any amount of elbow room and not so blamed much style as we have now days. McKinney Examiner, June 21, 195? The Baptist Church was organized in May 1865, and held services in the lower rooms of the old Masonic building until 1877 when they built a frame structure which was later replaced by the beautiful building which now stands. The charter membership of fifteen included the names of W. D. Chapman, E. F. Tatum, G. B. Robinson and John Turner. Rev. John Averett was the first pastor. The Presbyterian U. S. A. was organized June 14, 1868 by Rev. S. M. Wilkins. 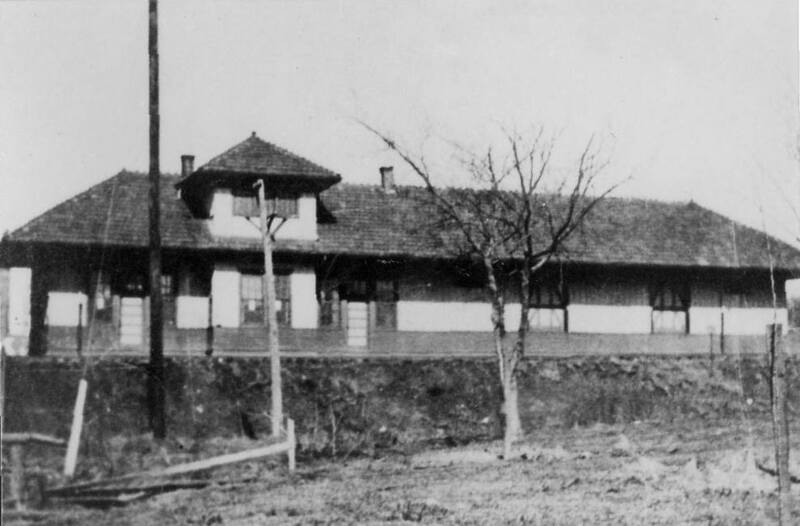 The number of members at the time were only thirteen. Joseph Aston and James F. Thompson were ordained as elders. W. A. Williams, Berry Spence, F. M. Proctor and J. M. Brooks were among the early pastors. The church was built in 1887. The Christian Church was organized in 1874 with a membership of six and held their meetings in the Baptist Church until 1884 when the present church was built. The first school of any importance was conducted in the "White Hall," or Masonic Hall, and Rev. W. A. Edwards was the teacher. Later a school was conducted on the present site of the Farmersville School, which was deeded to the city for a public school by the late Dr. A. H. Neathery and wife. This school was conducted by Messrs. Looney and Dowlan, assisted by Miss Sallie Hardin. This was later replaced by a brick building which soon became inadequate in size to accommodate the children of scholastic age, and the present building was erected. The I. O. O. F. Pride Lodge Number 238, was organized in 1875 with the following charter members: A. H. Neathery, J. A. Aston, C. T. Tatum., I. D. Kitchens, L. H. Marble, and Thomas Glass. A number of other secret orders have been organized. Two women's clubs, the Ingleside, organized in 1894, and the Culture Club in 1912. For years a Civic League flourished, doing much effective work and giving to the town the small park which is situated at the intersection of the two railroads. Farmersville has a chapter of Daughters of the Confederacy, which placed the monument in the center of this park. These clubs and organizations are factors for good in the community. Rike's Drug Store, which is one of the oldest business institutions of its kind in the state, was established in 1865. For many years, Farmersville had an annual event which was the onion Festival. Onion buyers would come from all over the United States to attend this gala festival. People would come from miles around and the festivities would go on for several days. About 1888 the Santa Fe Railroad was built through Farmersville. Before this railroad was built the only railroad that ran through the town was the "Narrow Gauge" Railroad, which was very crooked and its rails were very close together. The Katy Lines later bought the "Narrow Gauge" Railroad and made a standard size railroad out of it. In the early days, there were two distinct brands of Democrats in Collin County. There were the Ringtails and the Mugwumps, the old line Democracy and the reformers, who called themselves the Collin County Democracy. The split was caused because a bunch of practical politicians had suckled the public teat for a quarter of a century and you just couldn't prize them loose. They kept on running and kept on being elected. In the first election held, they elected their County Judge, Tax Assessor, and District Clerk. In the next election they lost all of their county candidates and that spelled the death of the Collin County Democracy. Then they organized the People's Party and run Nugent for Governor. It soon fizzled out and now is only a dream. Since the earliest days of Farmersville's history, progress has seemed to be the keynote, as a steady process of activity, growth and development has been the order of the day until at the present one needs only to visit this thriving little city to realize that it is one of the most progressive and wide-awake towns in this entire section of the country. Its steady growth from the historical day it was founded in 1854 to its present tabulation of about 2000 population is ample proof of the progress made by the whole hearted co-operation of those loyal citizens who have been instrumental in the building a community to which we can all point with pride as our very own.